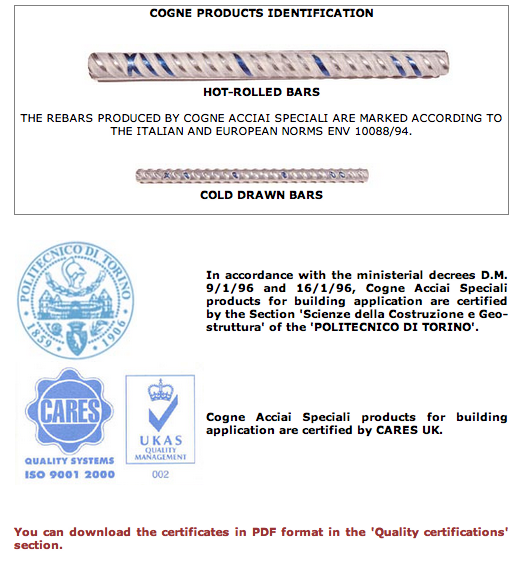 COGNE ACCIAI SPECIALI offers a wide range of STAINLESS STEEL REBAR (BARS and WIRE ROD with improved bond) for reinforced concrete. Specific and up-to-date production processes have been especially studied and set up to guarantee, in addition to the optimal heat resistance characteristics of stainless steel, the standard specifications required by different norms. 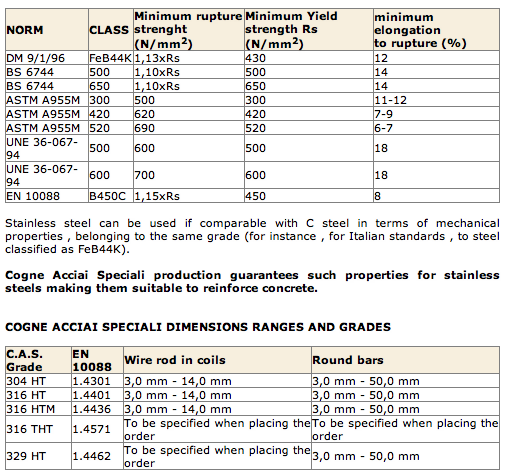 The available dimensions can be used either for static and structural rehabilitation (cold drawn bars up to 12.0 mm round) for the preservation of the architectonic and artistic heritage, or for the construction of new and long-lasting buildings along with transport substructures for civil or military purposes (hot-rolled round bars above 14 mm). Download the TECHNICAL SHEET in PDF format. COMPATIBILITY with other metallic materials used in the building sector and EASY WELDING.